Real friends look past each other’s faults. Rocky knows that Bullwinkle is rather dim-witted, but his heart is in the right place, so Rocky sticks by his side. It isn’t always easy, what with all the zaniness that Bullwinkle brings with his constant scheming; but that’s what friends do. The importance of safety equipment. Rocky is an expert flier, but he never leaves the ground without his helmet and goggles. Indeed, he never goes anywhere without his helmet and goggles, but he’s a good example for using protective gear nonetheless. Loyalty is a priceless commodity. It takes a true companion to stand by a knucklehead like Bullwinkle year after year. Rocky does it with nary a complaint, and is constantly looking after his friend with little or no reward for his efforts. Problem-solving sometimes calls for quick thinking. Rocky has a real knack for coming up with solutions on the fly, when the duo gets in a jam. He often has to salvage some cockamamie scheme of Bullwinkle’s in order to save the day. Blessed are the humble in spirit. Rocky is the brains of the team, and gets top billing on the show; yet he doesn’t mind playing second fiddle to Bullwinkle. A lesser squirrel would point out how inept the moose is and demand a larger role. Not Rocky. He’s content to be the sidekick. It helps to be multi-talented. Flying squirrel with credentials from Cedar Yorpantz Flying School, crime-solver, circus hand and magician’s assistant. Rocky does it all, and that makes this squirrel way more valuable than a one-trick pony. Size isn’t important. Rocky is a diminutive squirrel, but he’s able to hold up his end of any challenge. He even manages to carry Bullwinkle most of the time too. He shows that a little guy can get big jobs done. You’ve got to run before you can fly. 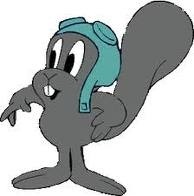 Even Rocky, a flying squirrel, had to complete flight school before taking to the air. He understood the need for formal training so he could fly safely and effectively to accomplish his missions. Staying dedicated to the mission. Let’s face it, most of us would be too distracted to get anything done, if we had the ability to fly. Rocket J. Squirrel doesn’t go in for flights of fancy, however. When the job calls for it, he stays planted firmly on the ground with his partner and friend, Bullwinkle. Using wits versus weapons. Rocky never has to use violence when fighting those no-goodniks, Boris and Natasha. He always chooses to out wit them instead. Kids learn to be resourceful, as well as the concept of non-violent conflict resolution. We have partnered with eNannySource to help you search for the perfect nanny in your area in addition to our other services. Our team of nanny agents are standing by & ready to assist you in your perfect nanny search! *Success fee is only due when we successfully find you a caregiver. Is Lying to Your Kids About the Tooth Fairy Wrong?